Kitchen and dining room is commonly adapted by the home owners who love an open kitchen concept or other similar concepts. 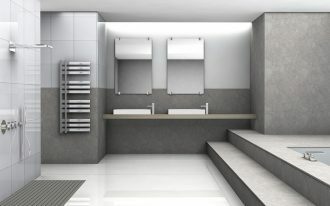 This idea obviously offers truly practical and efficient for space, so for you who matter a limited space, just choose this idea as the best option. 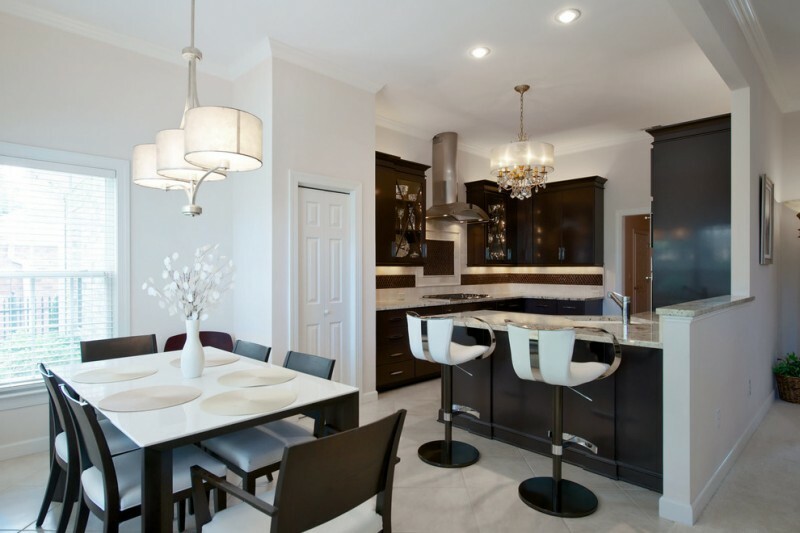 Well, the following are several inspiring ideas of kitchen and dining room. Find and select one or more than one ideas that suit your preference. Just check them out. A new concept of open kitchen which combining a kitchen with dining room. Why new? Both are separated by three steps down of stairs. The idea let people in the kitchen getting interaction with people gathering in the dining room. 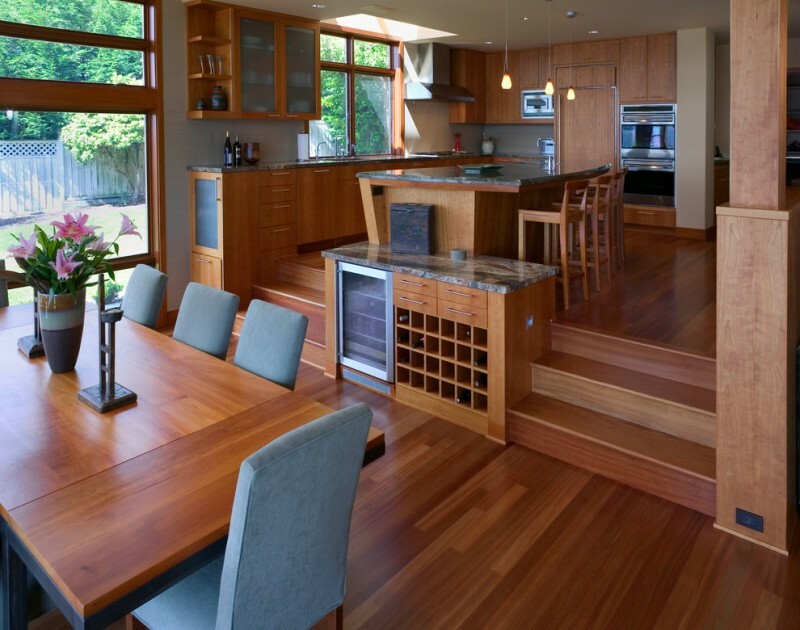 Interestingly, most kitchen properties are made from cedar. A modern kitchen with large glass windows open a barbeque space provides a modern-twist in in that space. 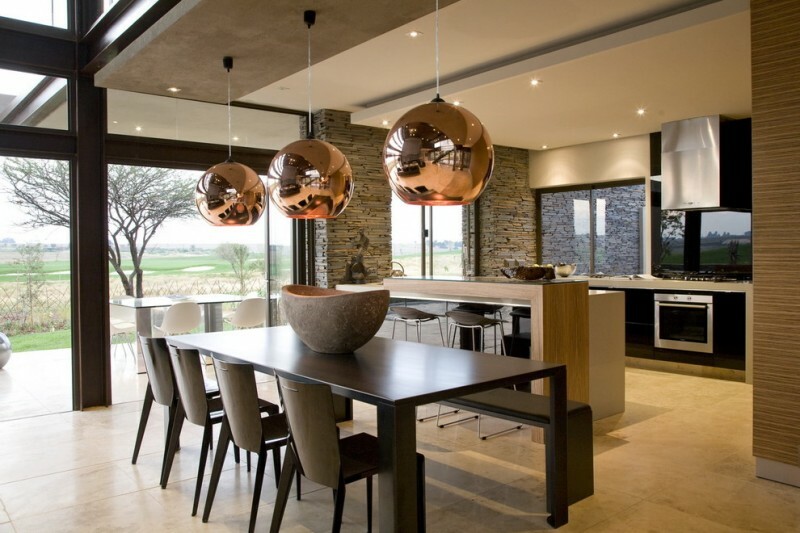 The owner creates a modern-twist just by adding several modern accents such as glossy copper-toned pendant lamps which are designed by giving so much of modern touch. 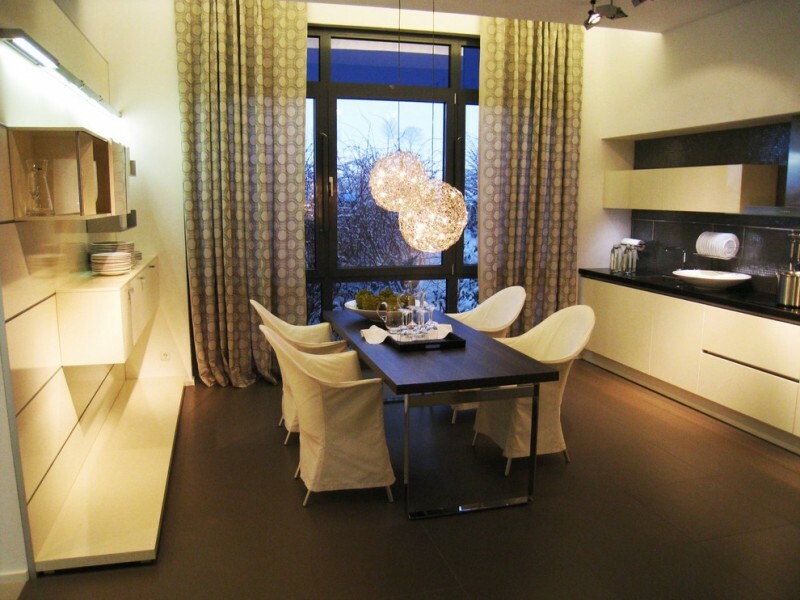 All primary elements like dining furniture set and kitchen properties are really made in simple and minimalist look. 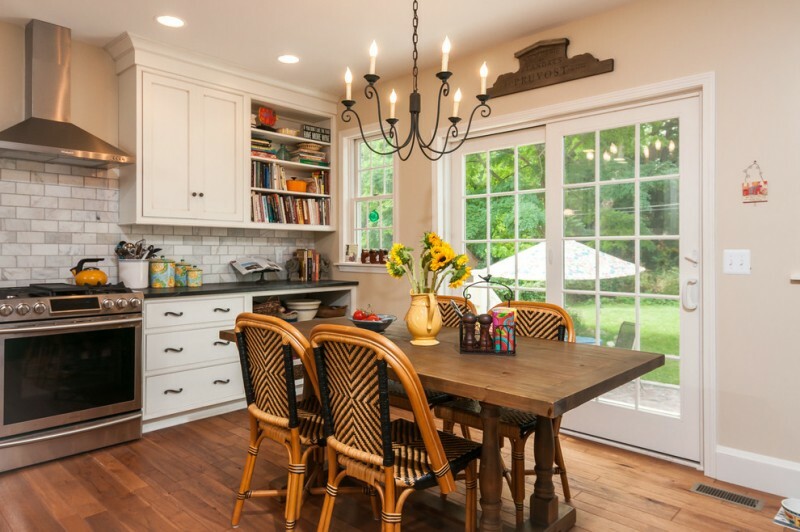 Simple subway tiles installation for backsplah area, cabinets with classic holders, rattan dining chairs, wooden dining table without finishing, and striking classic chandelier here are truly representing a rural or village-style kitchen idea. 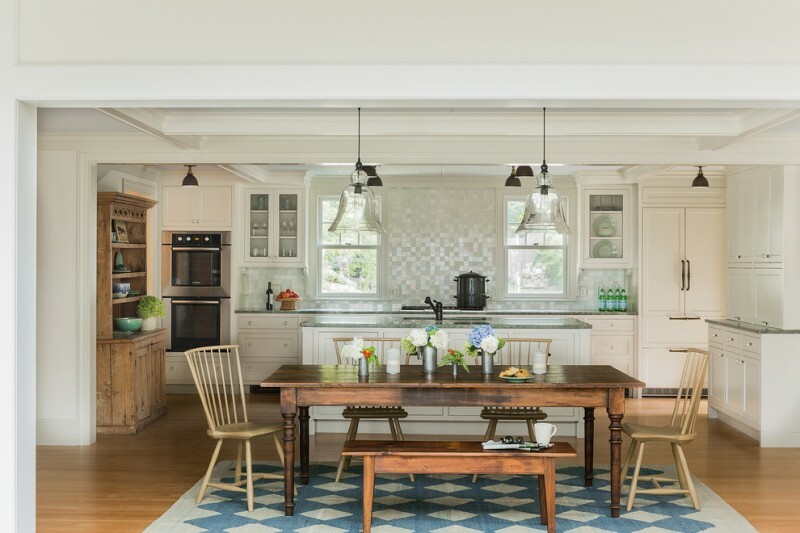 This one is so inspiring, especially for you dreaming of a stylish farmhouse kitchen. All elements are dominated by wood finishing. Walnut upper cabinets, cherry under cabinets with granite surface, and oak-finishing floors; this is a great idea to involve the nature (represented from wooden as the main material) as crucial part of kitchen design. Beige, dominant tone used in this kitchen design, also closely connects to nature-color-scheme. So, all is a perfect combination, right? 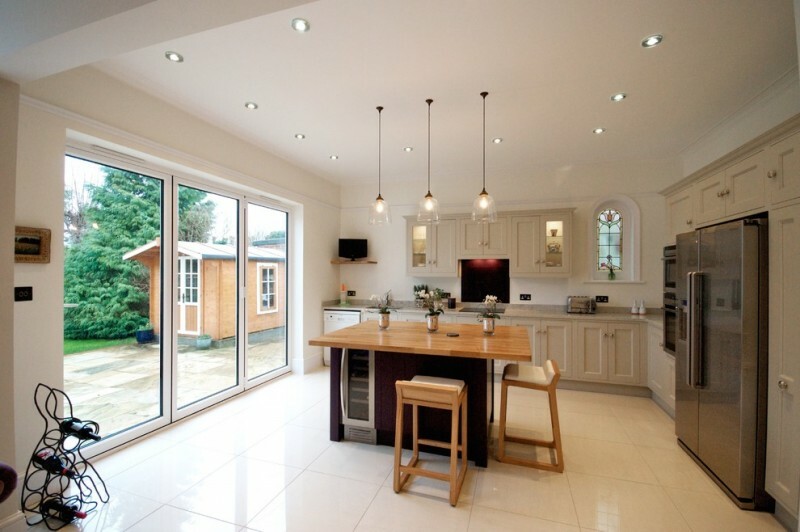 Extra natural lights fill the space, resulted from glass doors inserted with sliding doors & large windows. A medium-size skylight also plays its role here as the light source. 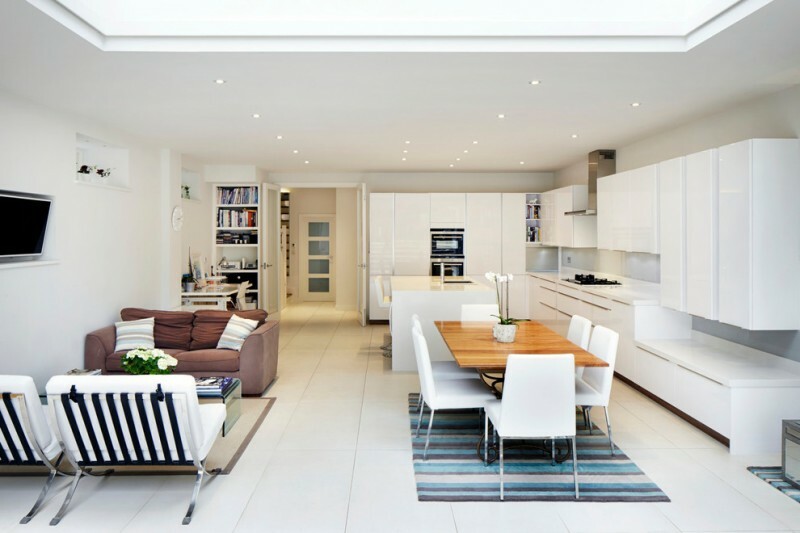 The space designed in white tone displays how the contemporary additions are being added dominantly. What a wonderful if blend two different styles in one. 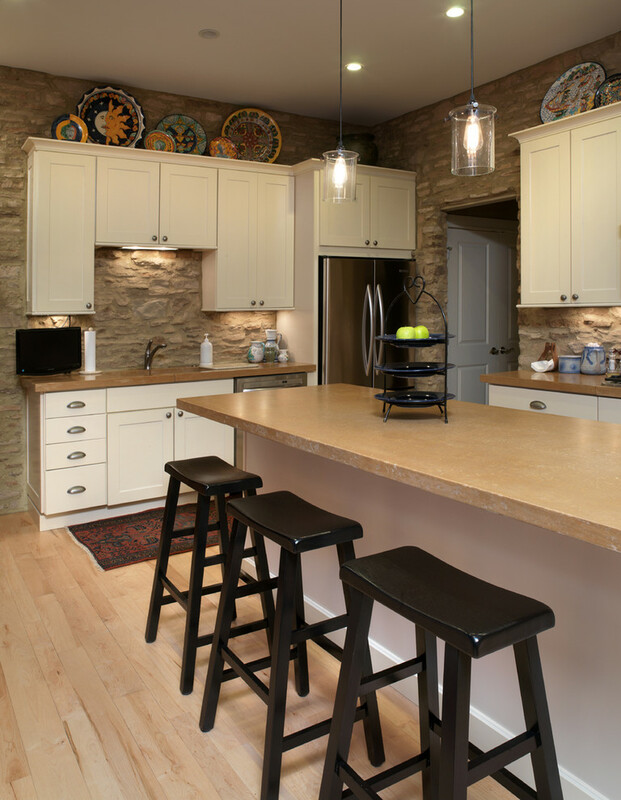 Like this kitchen; the owner puts a rural interior style as special addition. 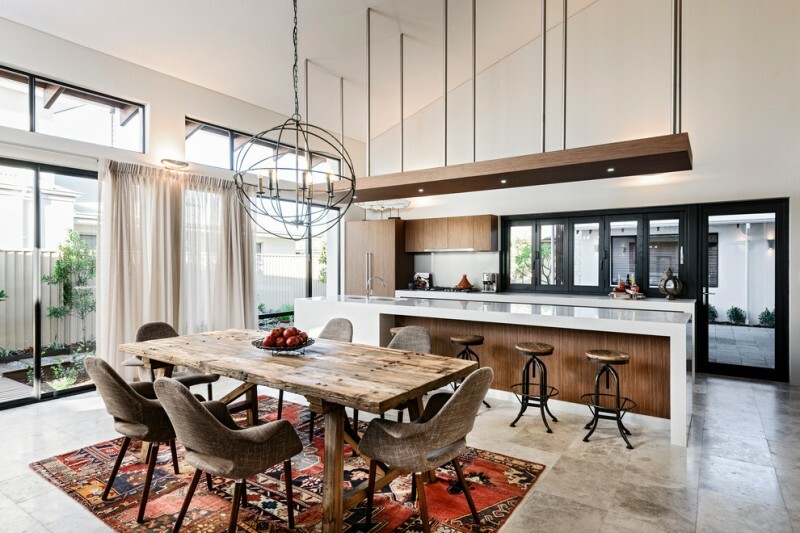 The dining table without finishing and rug with rural-look patterns are two important elements reflecting a typical rural’s interior characteristics. By contrast, other elements are designed in modern or even minimalist style. That’s so interesting. It’s always fun to collaborate two contrasted color schemes in an open space. 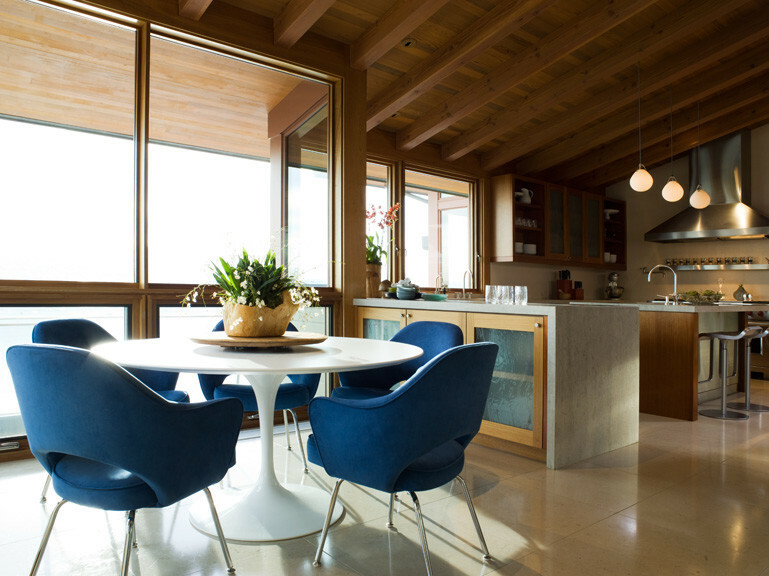 A set of modern dining furniture (striking blue chairs and round white table) looks like a special element among earthy-schemed kitchen’s properties. This is called a special accent or a focal point. A pass-through kitchen is supported with a large window to make the owner easier to serve & to travel the dish to family or guess sitting on the dining chairs. 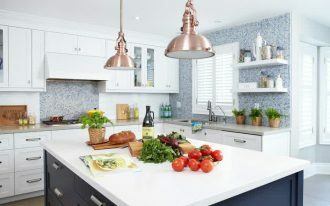 This idea is quite unique and practical, so it suits to you who like a simple yet accessible open kitchen. 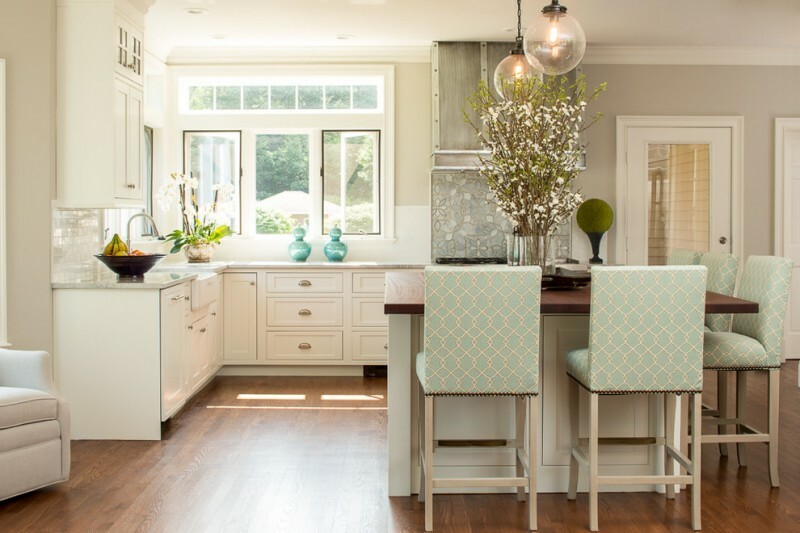 This kitchen diner is a smart transformation of a dining room. 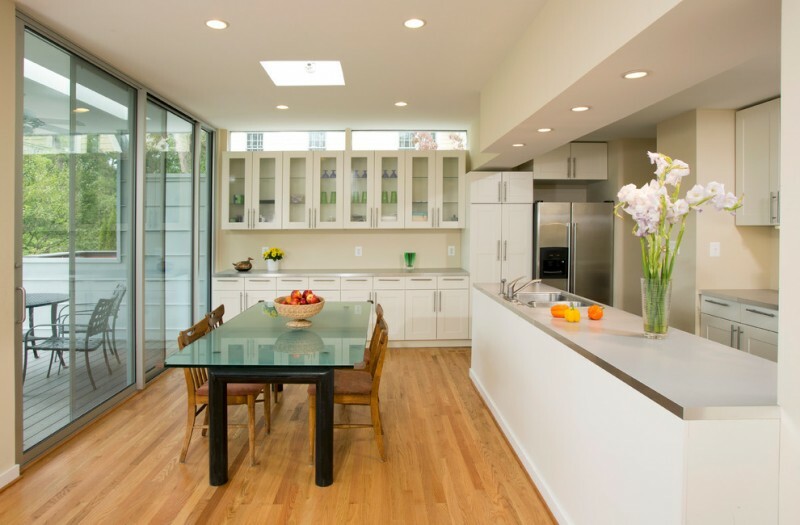 The owner has converted a dining room into a stylish kitchen diner with sliding glass door and windows. Nature scheme here is applied on a set of dining furniture, creating a contrast look among fully grey kitchen’s properties. This combination, of course, makes this space much more stylish. A classy and luxurious open space is wonderfully presented in this room. The room which is dominantly filled with white-schemed kitchen’s properties, looks more attractive with some striking and contrasting furniture as well, like earthy wood-color dining table set with white dining chairs, brown sofa collaborated with glass center table, and many soon. It’s so elegant to combine the dove-black scheme and wood-color scheme in a transitional kitchen. Both are contrast for each other, so there is no need to add any special accent or focal point into the space. One that makes it more attractive is a pendant lamp designed in semi-classic style. 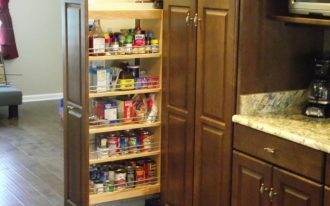 Want to have a practical kitchen diner? This one might be your choice. A permanent L-shape sofa looks interesting with accent pillows as the decorative items. 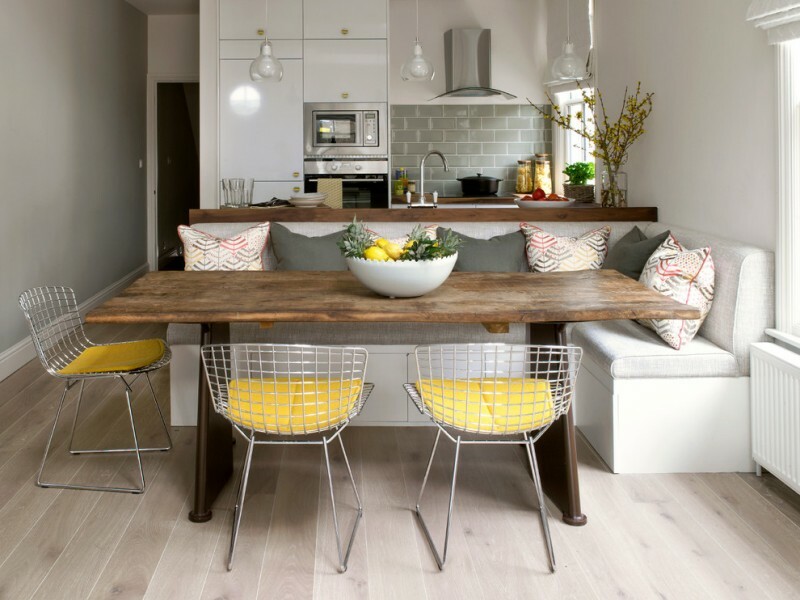 Dining side chairs with yellow seating is intentionally set to improve the dining area. 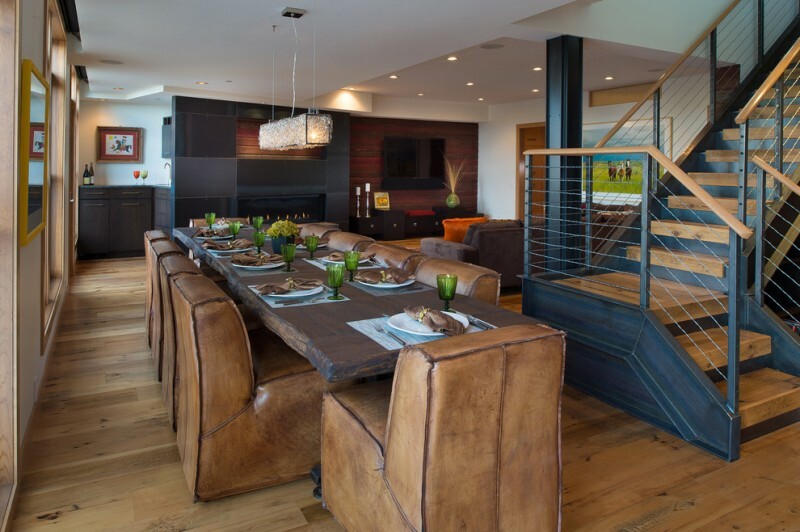 Then, rectangular dining table is designed in rustic style becomes a special accent in this room. 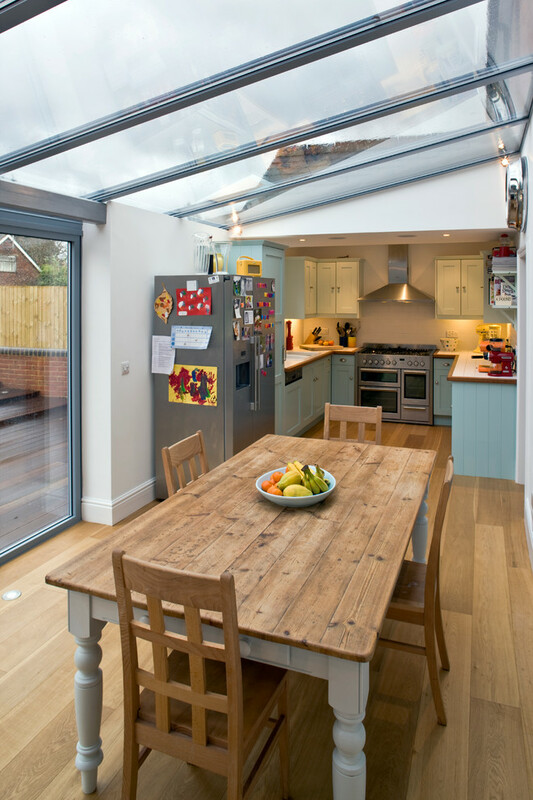 Large skylight-roof covers a small space where U-shape kitchen and dining room. This kind of roof lets the natural lights enter into the room massively. 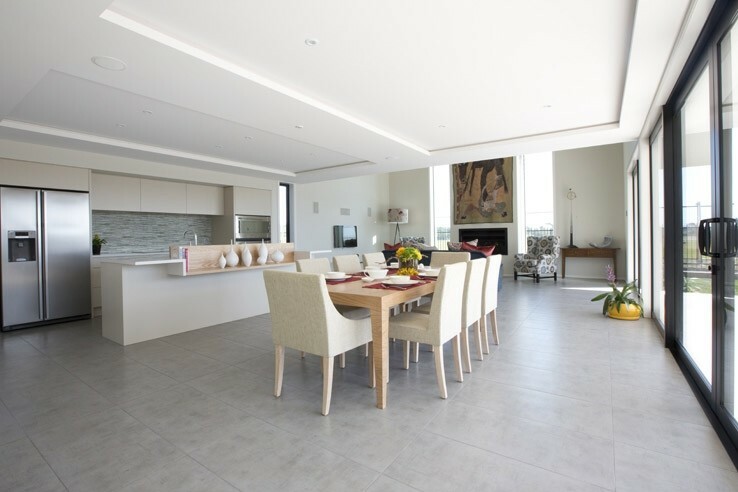 A barn conversion here has been transformed into an open kitchen and dining space. At glance, we can still find out the barn’s elements like barn’s door, but in the inner space, we’ll find kitchen & dining room’s furniture sets. 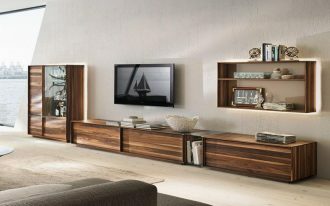 And, more interestingly, most of furniture and other interior stuffs are dominated with Oak finishing. Black Bean concept, it sounds so interesting. The concept applies black and white as the primary schemes. Dining furniture, for instance, uses black and white to cover each item. Then, the kitchen’s cabinets are painted in black, so they’re opposite to countertop and walls in color. A modern minimalist open kitchen integrated with dining room is a best choice for everyone dreaming of large-space of eating and cooking area. This one is so inspiring. 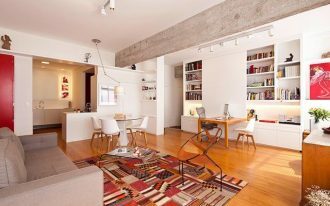 The owner chooses pale beige and grey tones as the primary colors. Both keep stunning after windows & door’s black frames are being added. Create a warming nuance only by choosing right ambiance. Here, we found that the owner uses original red bricks to build the walls. 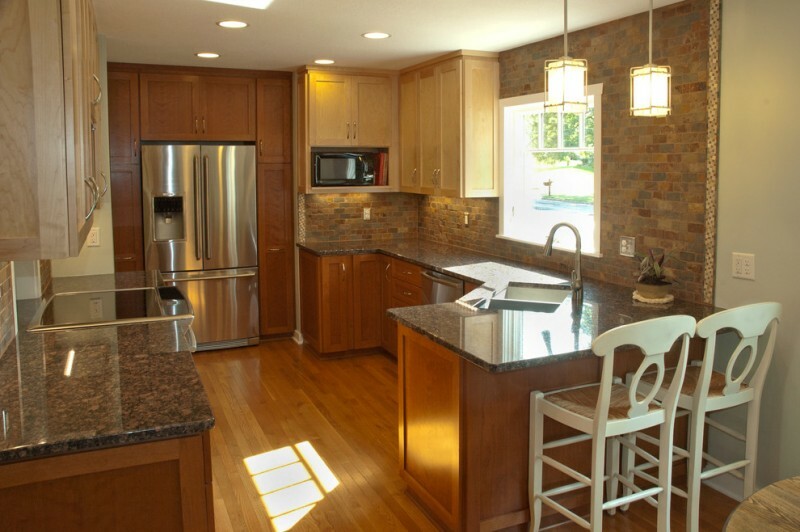 These bricks walls really help to maximize the creation of warmth in this space. Moreover, the set of wooden dining furniture also reinforce the idea of warming space. 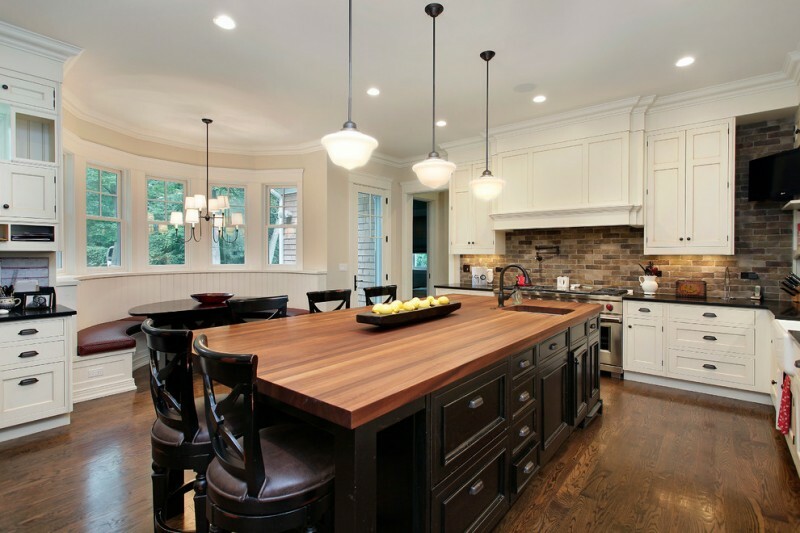 A traditional open kitchen which is integrated with simple dining furniture is always interesting. Blue-white patterned rug can provide another tone after white and wood-color dominating the room. A pair of glass ring bell-shape pendant lamps makes the room looks so much attractive. Kitchen island integrated with eating area is one of perfect solution to make a space much more efficient. 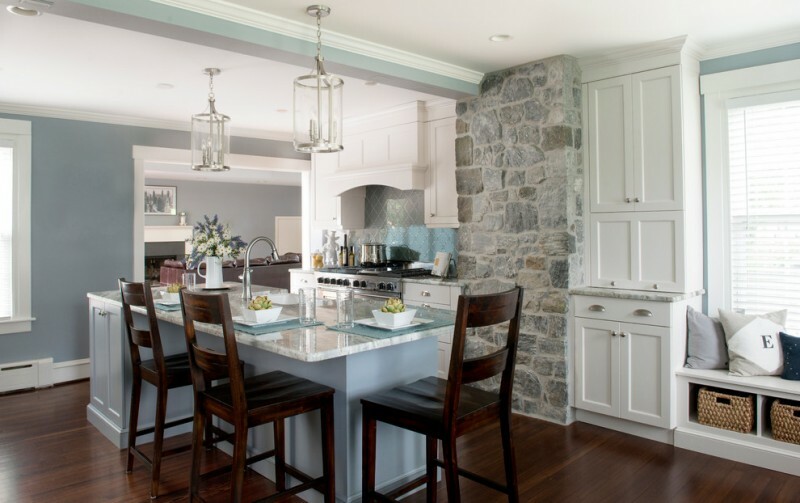 This one is an open kitchen which highlights the nature stones as the main accent. 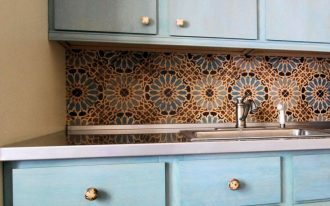 The accent is installed in one of kitchen’s walls. Then, dark-toned wood dining chairs are intentionally set to add another striking tone. So do the floors. Where do we find candlelight effect? Well, candlelight effects are actually just the effects of warm-ambiance produced by the series of recessed lamps. These lamps are installed in many spots like ceiling and area under the cabinets. This idea is inspired from the House River which has been designed in modern rustic. 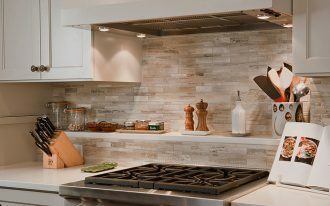 We’ve found rustic style in the kitchen walls where textured beige walls have been applied. The warm-lights produced by the recessed lamps under the cabinets also support the warm look, especially in the area illuminated by those lamps. Based on this idea, half-circular dining sofa becomes the most unique one as it has striking and distinctive style. 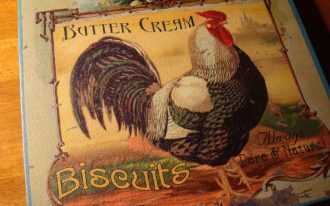 It’s clear to see that most properties and tones of color are set in traditional style. But, there’s just one spot that is recognizable as modern-style item. Isn’t it? 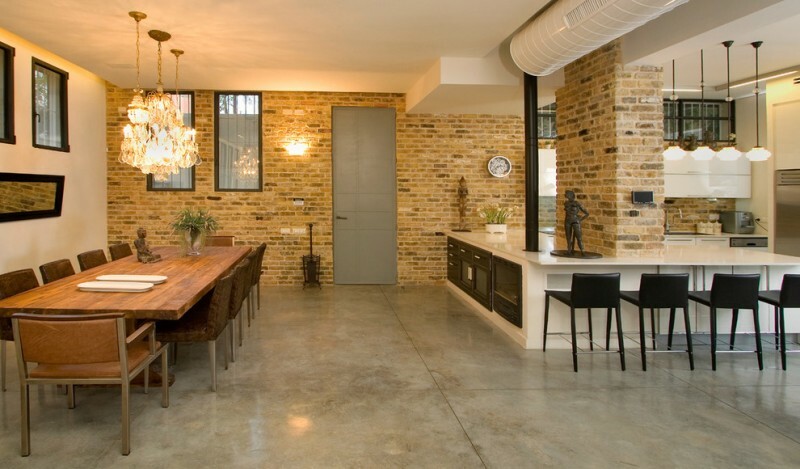 Solid-Rustic kitchen & dining area is a new idea to apply. This one, for example, is very unique because the kitchen and dining area are set near of under staircase area. Take a look at the color tones applied on each part of space. Most of them are solid ones in which they actually represent raw rustic style. This idea is well recommended for you whose space matter in the house. 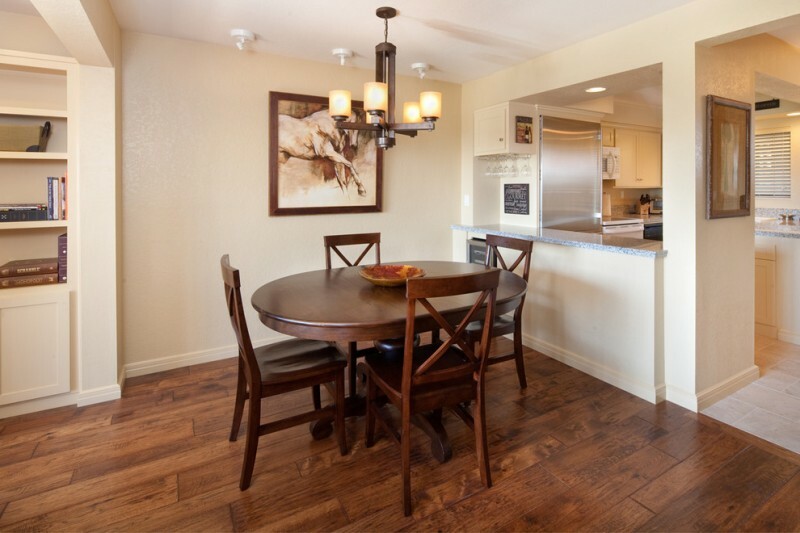 Both kitchen and dining room are designed in small size but still comfortable to use. 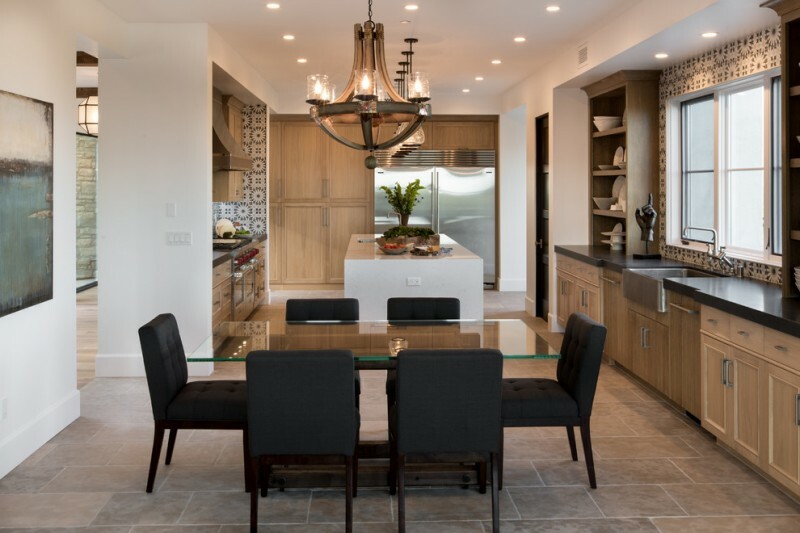 For such space, it’s important to select the right dining furniture and kitchen properties and try to prioritize the proportion first over the other things. Turquoise-finishing covered the chairs inspire fun and beauty. This tone also gives the vibrant feel for the chairs themselves. Then, the corner windows allow the sunlight enters the room and warm it naturally. The natural lights also bring the colors inside much brighter, so they’re so striking. 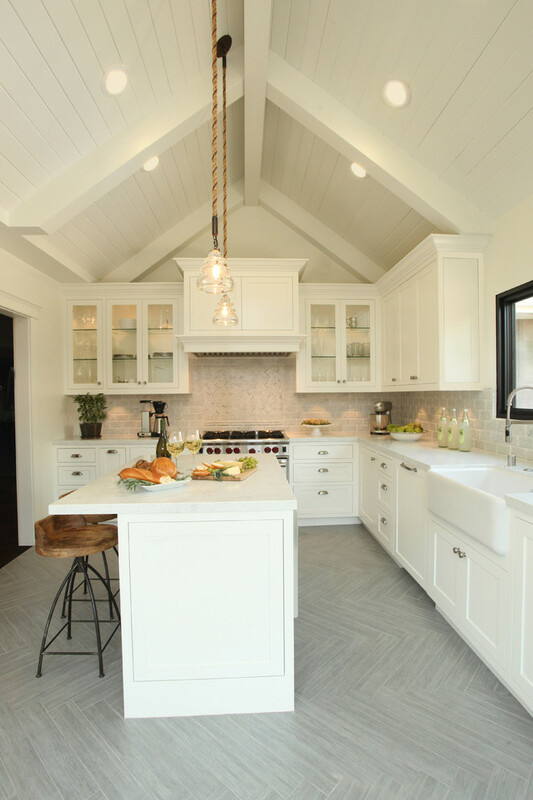 Wood-top island and white cabinetry balance out one another, so the owner doesn’t need to add attractive accent into this space. And, a pair of industrial barstools with classic pattern creates unique appearance. 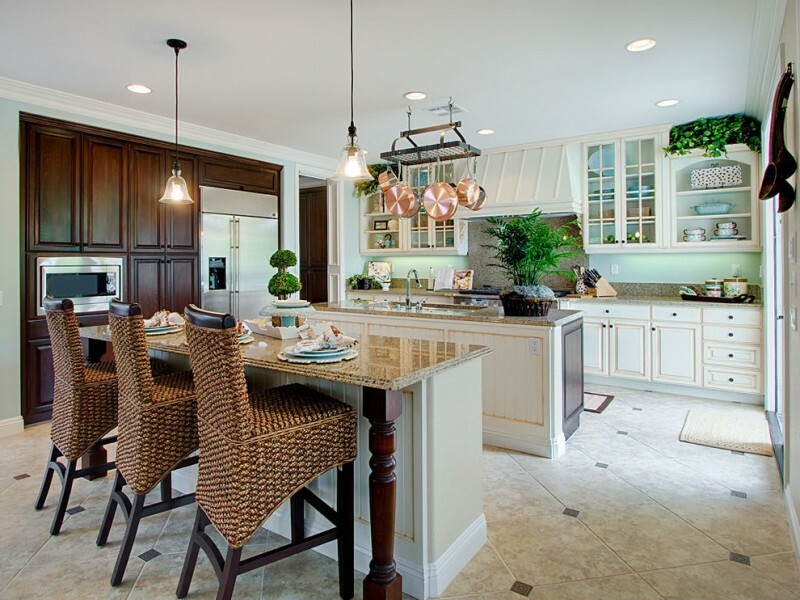 The rattan chairs and cabinetry complete have similar tones and they look so great after being collaborated with lighter tones of color like white and beige found at under cabinets and island, countertop, and dining table. White slipcovers installed in dining chairs improve the kitchen’s value. 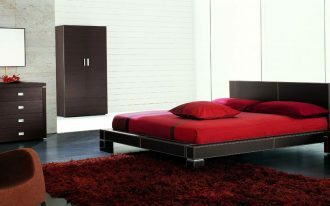 They have succeeded in making the room much more classy and luxurious. Moreover, the space is supported with warm-lights illuminated by a spot light over countertop and recessed lamps under white cabinets. 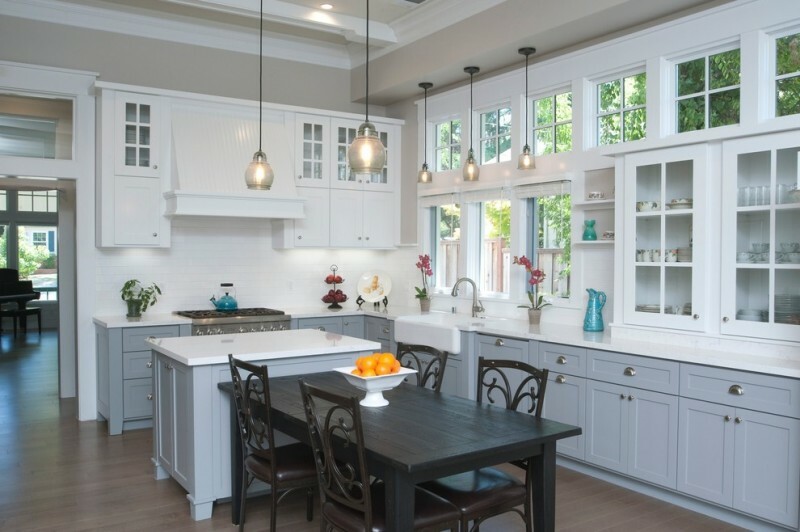 This one is the sample of modern farmhouse kitchen and dining room idea. Arched roof top is one of farmhouse characteristics, and it has been combined with furniture and kitchen properties designed with modern touch. Grey, white, and black are color combination which are applied on different objects. The black one (dining furniture set) becomes the most striking and most attractive accent for the room. In the other hands, white and grey here is aimed at reducing dining furniture’s dominant appearance, so they can be a perfect balanced tone combination. The room is filled with wooden finishes, starting from cherry to pine. 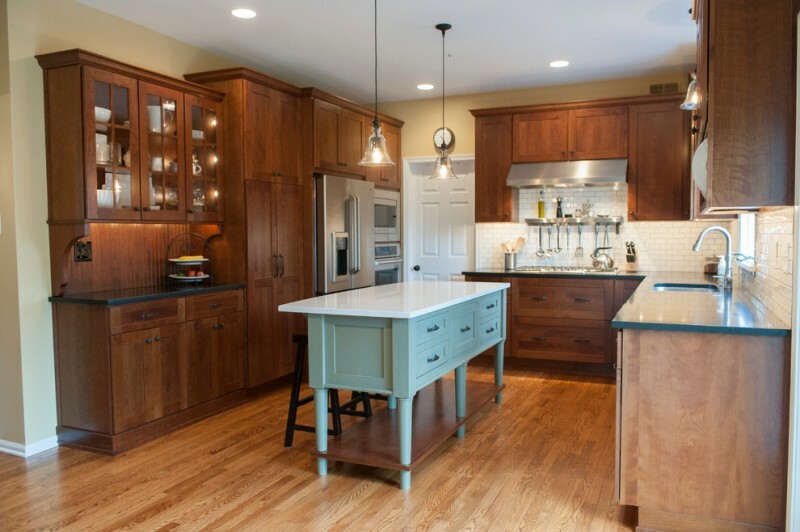 Cabinetry and floors are covered with Cinnamon finish, while a craftsman panel door and vintage-style bar table are painted in brighter finishes.